Hannah Genders advises on how to make gardens more diverse. At the start of this New Year, this article is going to sound as if I’m encouraging you to make some New Year resolutions – and I have to confess that I am! The aim is for all of us to garden in a way that is more wildlife-friendly, and over the last few years I’ve become more aware of how important this is and which wildlife needs our help. Our gardens have become havens for native wildlife over the past decade. This is because we grow such a wide variety of shrubs, trees and flowers that can benefit bees, butterflies and birds – but some animals are still struggling and their numbers are dropping. Hedgehogs particularly come into this category and there is now evidence that these little mammals could be extinct in 15 years. Most of us can remember them being so common on Bonfire Nights when we were children, so this seems utterly tragic to me. 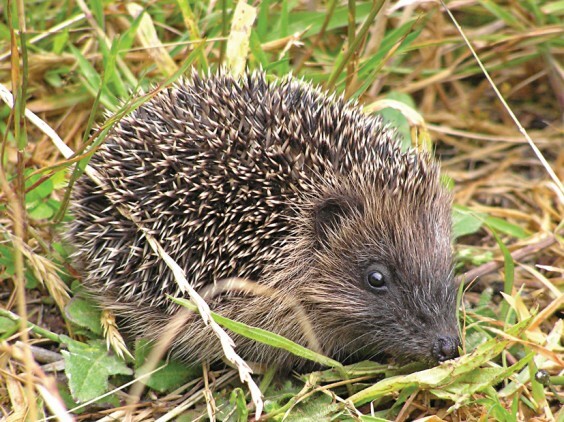 We have a nest of hedgehogs hibernating in our garden as I write this. They have found the ideal place to nest in the walled garden – safe from the road and at the base of the house wall, so it should be warm and dry. It’s also under a holly bush that is dense with growth so should offer some protection, and they are covered with dry leaves. We found them late in the autumn when the nights were still warm and they hadn’t started their hibernation. I think there are about five or six babies, most likely born earlier this year. I fed them right up until the weather turned a little colder and they stopped appearing. As they don’t hibernate continuously all winter, it’s important to leave a little bit of food and water out for the odd few days when they appear, as this is when they are very hungry and need to keep their body weight up. The old idea of bread and milk is wrong as hedgehogs are lactose intolerant, so either buy some specialist food or put down cat or dog food. I was advised to choose chicken or fish-based food as it is nearer to their natural diet, rather than red meats. I have to say I loved feeding them and seeing them come out late in the evening to noisily eat their food; they were so close I could have touched them. There are some essential things hedgehogs need to increase their numbers. Firstly, a good place to nest: either a nest box or leave areas of the garden a bit more wild with piles of logs and leaves – don’t be too tidy. It’s very important not to use slug pellets, as you are not only poisoning slugs but adding poison to the whole food chain. Try beer traps and grit instead. Allow gaps in the bottom of the fence – hedgehogs cover an area of several gardens in their search for food and the more we have replaced hedges with fence panels, the harder they are finding it to forage and meet a mate. As they love to hide in leaves or long grass, be careful to check a bonfire before you light it or long grass before you strim it. Ponds are only a problem if they are steep-sided so the hedgehog can’t climb out – make sure there are some shallow sections to help them. I’ve written lots of times about bees and beneficial insects and how to create a garden that helps them.Early nectar is important, especially for bumble bees who usually come out first. Iris reticulata or Anemone blanda are great as they flower in February, then all the cottage garden flowers that either have a single open flower or a composite head (such as Achillea and Allium) are ideal through the season. Do keep an eye out for what visits your flowers – last summer I had the privilege of seeing a beautiful comma butterfly. Late nectar plays a very important role too, giving them a final boost before winter: asters and late flowering salvias are ideal and ivy grown on a wall or fence will flower long into the winter. Insect houses are great for them to nest in; solitary bees especially will use these. Site them on a sunny wall to get the most residents. As farming has become more and more of a monoculture with the removal of native hedges, our gardens act like corridors for bees and butterflies and the more of us who garden for them, the longer the corridors get and link up across the country. If you have any nest boxes this is the month to clean them out ready for the birds to start nesting again next month. Clear out all the old nest and any of last year’s eggs. Unlike the insect homes, a nest box should be sited on a wall with some shade so the young birds don’t get too hot in the sun – it’s also best to site them some distance from a feeder as birds are very territorial and won’t use a box that is too close to lots of other birds feeding. Habitat is such a key element for birds as well as food. If you have fences, could you replace them with a native hedge? A hawthorn and dog rose hedge can look fabulous and is ideal for so much of our wildlife. There is still time to plant one before the end of February, and if you buy the plants bare-root and not container-grown it’s much cheaper. I’ve replanted a hedge down one side of our garden and just three years on it’s taking shape nicely. So here’s the New Year’s proposal: be untidy in your garden, don’t use poisons, and increase the biodiversity.